A Spike Milligan opus, containing everything from classics to hidden gems, with a foreword by Eddie Izzard. 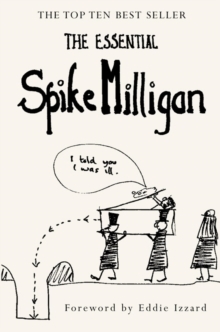 This stunning anthology of Spike Milligan's work comprises of favourites from his classic books (`Adolf Hitler: My Part in his Downfall', `Goodbye Soldier', `Puckoon'...) as well as scripts from the now-classic Goon Show. Interspersing such comic genius is also a touching collection of letters and his celebrated and liberating writings on depression, demonstrating the diverse talent of a man whose creative output spanned over half a century. A selection of children's poetry and writings (`Unspun Socks for A Chicken's Laundry', `A Book of Milliganimals', `Silly Verse for Kids' and much more) reveals Spike's irresistible connection with the childlike imagination and a brillant sense of the ridiculous. All the favourite and funniest stories are there. For those who want an excellent introduction to the mind of Milligan or a welcome return to a much-loved genius, this is the ultimate Milligan reader.